Mechanics of materials is a branch of applied mechanics that deals with the behavior of solid bodies subjected to various types of loading. Other names for this field of study are strength of materials and mechanics of deformable bodies. The solid bodies considered in this book include bars with axial loads, shafts in torsion, beams in bending, and columns in compression. and bridges, machines and motors, or ships and spacecraft. That is why mechanics of materials is a basic subject in so many engineering fields. Statics and dynamics are also essential, but those subjects deal primarily with the forces and motions associated with particles and rigid bodies. In mechanics of materials we go one step further by examining the stresses and strains inside real bodies, that is, bodies of finite dimensions that deform under loads. To determine the stresses and strains, we use the physical properties of the materials as well as numerous theoretical laws and concepts. Theoretical analyses and experimental results have equally important roles in mechanics of materials. We use theories to derive formulas and equations for predicting mechanical behavior, but these expressions cannot be used in practical design unless the physical properties of the materials are known. Such properties are available only after careful experiments have been carried out in the laboratory. Furthermore, not all practical problems are amenable to theoretical analysis alone, and in such cases physical testing is a necessity. 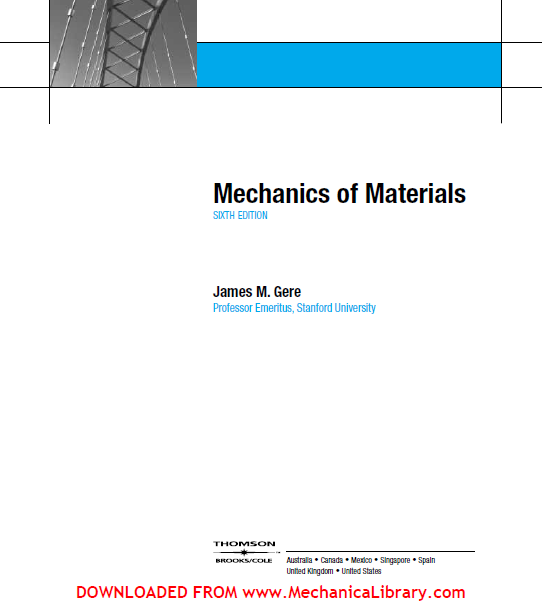 The historical development of mechanics of materials is a fascinating blend of both theory and experiment—theory has pointed the way to useful results in some instances, and experiment has done so in others. Such famous persons as Leonardo da Vinci (1452–1519) and Galileo Galilei (1564–1642) performed experiments to determine the strength of wires, bars, and beams, although they did not develop adequate theories (by today’s standards) to explain their test results. By contrast, the famous mathematician Leonhard Euler (1707–1783) developed the mathematical theory of columns and calculated the critical load of a column in 1744, long before any experimental evidence existed to show the significance of his results. Without appropriate tests to back up his theories, Euler’s results remained unused for over a hundred years, although today they are the basis for the design and analysis of most columns. 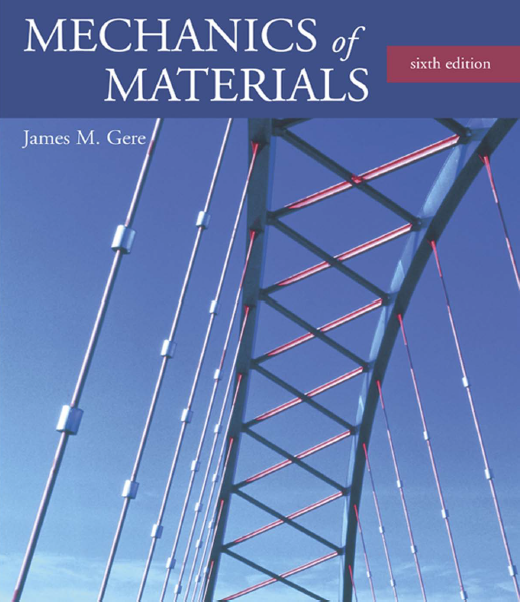 Problems : When studying mechanics of materials, you will find that your efforts are divided naturally into two parts: first, understanding the logical development of the concepts, and second, applying those concepts to practical situations. The former is accomplished by studying the derivations, discussions, and examples that appear in each chapter, and the latter is accomplished by solving the problems at the ends of the chapters. Some of the problems are numerical in character, and others are symbolic (or algebraic). an algebraic solution shows the manner in which each variable affects the results, as when one variable appears in the numerator and another appears in the denominator. Furthermore, a symbolic solution provides the opportunity to check the dimensions at every stage of the work. Finally, the most important reason for solving algebraically is to obtain a general formula that can be used for many different problems. In contrast, a numerical solution applies to only one set of circumstances. Because engineers must be adept at both kinds of solutions, you will find a mixture of numeric and symbolic problems throughout this book. Numerical problems require that you work with specific units of measurement. In keeping with current engineering practice, this book utilizes both the International System of Units (SI) and the U.S. Customary System (USCS). A discussion of both systems appears in Appendix A, where you will also find many useful tables, including a table of conversion factors. All problems appear at the ends of the chapters, with the problem numbers and subheadings identifying the sections to which they belong. In the case of problems requiring numerical solutions, odd-numbered problems are in USCS units and even-numbered problems are in SI units. The only exceptions are problems involving commercially available structural-steel shapes, because the properties of these shapes are tabulated in Appendix E in USCS units only. The techniques for solving problems are discussed in detail in Appendix B. In addition to a list of sound engineering procedures, Appendix B includes sections on dimensional homogeneity and significant digits. These topics are especially important, because every equation must be dimensionally homogeneous and every numerical result must be expressed with the proper number of significant digits. In this book, final numerical results are usually presented with three significant digits when a number begins with the digits 2 through 9, and with four significant digits when a number begins with the digit 1. Intermediate values are often recorded with additional digits to avoid losing numerical accuracy due to rounding of numbers. When a beam with a straight longitudinal axis is loaded by lateral forces, the axis is deformed into a curve, called the deflection curve of the beam. 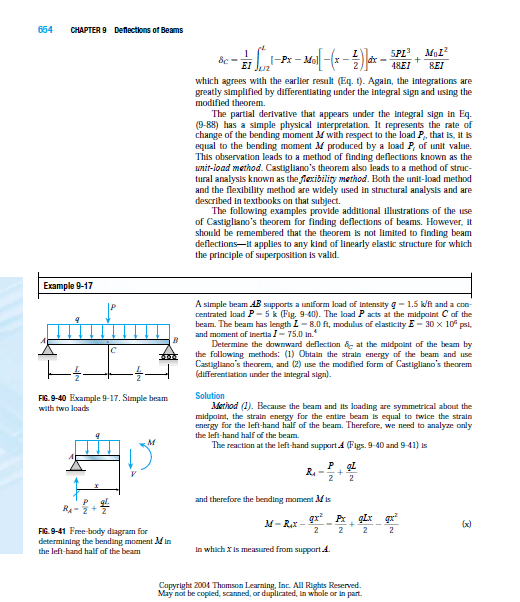 In Chapter 5 we used the curvature of the bent beam to determine the normal strains and stresses in the beam. However, we did not develop a method for finding the deflection curve itself. In this chapter, we will determine the equation of the deflection curve and also find deflections at specific points along the axis of the beam. The calculation of deflections is an important part of structural analysis and design. For example, finding deflections is an essential ingredient in the analysis of statically indeterminate structures (Chapter 10). Deflections are also important in dynamic analyses, as when investigating the vibrations of aircraft or the response of buildings to earthquakes. Deflections are sometimes calculated in order to verify that they are within tolerable limits. For instance, specifications for the design of buildings usually place upper limits on the deflections. Large deflections in buildings are unsightly (and even unnerving) and can cause cracks in ceilings and walls. In the design of machines and aircraft, specifications may limit deflections in order to prevent undesirable vibrations. In this chapter we will analyze beams in which the number of reactions exceeds the number of independent equations of equilibrium. Since the reactions of such beams cannot be determined by statics alone, the beams are said to be statically indeterminate. The analysis of statically indeterminate beams is quite different from that of statically determinate beams. When a beam is statically determinate, we can obtain all reactions, shear forces, and bending moments from free-body diagrams and equations of equilibrium. Then, knowing the shear forces and bending moments, we can obtain the stresses and deflections. However, when a beam is statically indeterminate, the equilibrium equations are not sufficient and additional equations are needed. The most fundamental method for analyzing a statically indeterminate beam is to solve the differential equations of the deflection curve, as described later in Section 10.3. Although this method serves as a good starting point in our analysis, it is practical for only the simplest types of statically indeterminate beams. Therefore, we also discuss the method of superposition (Section 10.4), a method that is applicable to a wide variety of structures. In the method of superposition, we supplement the equilibrium equations with compatibility equations and force-displacement equations. (This same method was described earlier in Section 2.4, where we analyzed statically indeterminate bars subjected to tension and compression.) 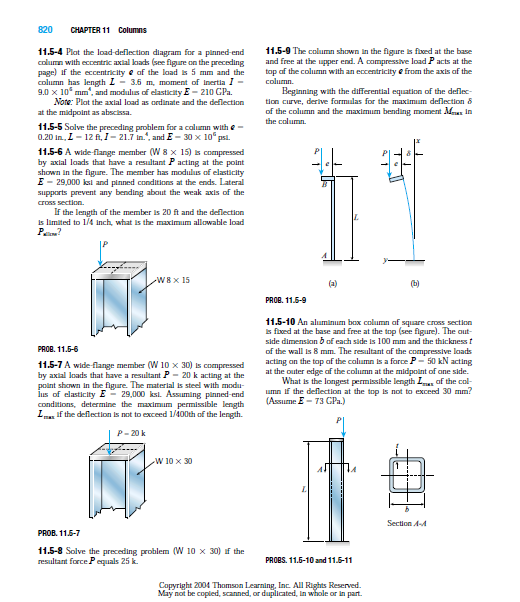 In the last part of this chapter we discuss two specialized topics pertaining to statically indeterminate beams, namely, beams with temperature changes (Section 10.5), and longitudinal displacements at the ends of beams (Section 10.6). 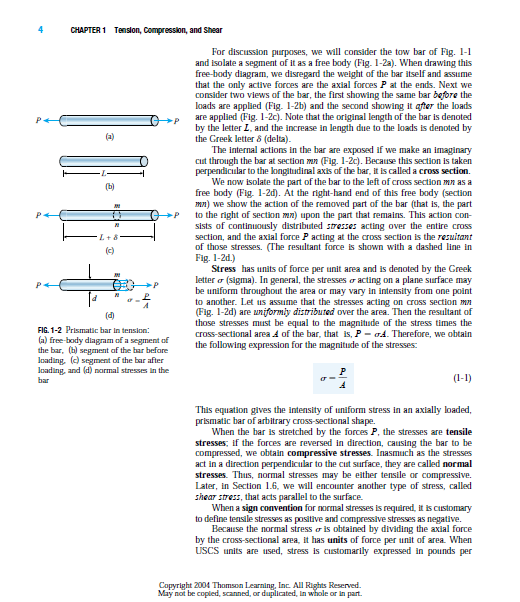 Throughout this chapter, we assume that the beams are made of linearly elastic materials. Although only statically indeterminate beams are discussed in this chapter, the fundamental ideas have much wider application. Most of the structures we encounter in everyday life, including automobile frames, buildings, and aircraft, are statically indeterminate. However, they are much more complex than beams and must be designed by very sophisticated analytical techniques. Many of these techniques rely on the concepts described in this chapter, and therefore this chapter may be viewed as an introduction to the analysis of statically indeterminate structures of all kinds. limits. Thus, strength and stiffness are important factors in design, as discussed throughout the preceding chapters. Another type of failure is buckling, which is the subject matter of this chapter. We will consider specifically the buckling of columns, which are long, slender structural members loaded axially in compression (Fig. 11-1a). If a compression member is relatively slender, it may deflect laterally and fail by bending (Fig. 11-1b) rather than failing by direct compression of the material. You can demonstrate this behavior by compressing a plastic ruler or other slender object. When lateral bending occurs, we say that the column has buckled. Under an increasing axial load, the lateral deflections will increase too, and eventually the column will collapse completely. The phenomenon of buckling is not limited to columns. Buckling can occur in many kinds of structures and can take many forms. When you step on the top of an empty aluminum can, the thin cylindrical walls buckle under your weight and the can collapses. When a large bridge collapsed a few years ago, investigators found that failure was caused by the buckling of a thin steel plate that wrinkled under compressive stresses. Buckling is one of the major causes of failures in structures, and therefore the possibility of buckling should always be considered in design. The most fundamental concepts in mechanics of materials are stress and strain. These concepts can be illustrated in their most elementary form by considering a prismatic bar subjected to axial forces. A prismatic bar is a straight structural member having the same cross section throughout its length, and an axial force is a load directed along the axis of the member, resulting in either tension or compression in the bar. Examples are shown in Fig. 1-1, where the tow bar is a prismatic member in tension and the landing gear strut is a member in compression. Other examples are the members of a bridge truss, connecting rods in automobile engines, spokes of bicycle wheels, columns in buildings, and wing struts in small airplanes. For discussion purposes, we will consider the tow bar of Fig. 1-1 and isolate a segment of it as a free body (Fig. 1-2a). When drawing this free-body diagram, we disregard the weight of the bar itself and assume that the only active forces are the axial forces P at the ends. Next we consider two views of the bar, the first showing the same bar before the loads are applied (Fig. 1-2b) and the second showing it after the loads are applied (Fig. 1-2c). Note that the original length of the bar is denoted by the letter L, and the increase in length due to the loads is denoted by the Greek letter d (delta). Stress has units of force per unit area and is denoted by the Greek letter s (sigma). In general, the stresses s acting on a plane surface may be uniform throughout the area or may vary in intensity from one point to another. Let us assume that the stresses acting on cross section mn (Fig. 1-2d) are uniformly distributed over the area. Then the resultant of those stresses must be equal to the magnitude of the stress times the cross-sectional area A of the bar, that is, P sA. This equation gives the intensity of uniform stress in an axially loaded, prismatic bar of arbitrary cross-sectional shape. 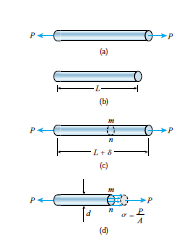 When the bar is stretched by the forces P, the stresses are tensile stresses; if the forces are reversed in direction, causing the bar to be compressed, we obtain compressive stresses. Inasmuch as the stresses act in a direction perpendicular to the cut surface, they are called normal stresses. Thus, normal stresses may be either tensile or compressive. Later, in Section 1.6, we will encounter another type of stress, called shear stress, that acts parallel to the surface. When a sign convention for normal stresses is required, it is customary to define tensile stresses as positive and compressive stresses as negative. Because the normal stress s is obtained by dividing the axial force by the cross-sectional area, it has units of force per unit of area. When USCS units are used, stress is customarily expressed in pounds per square inch (psi) or kips per square inch (ksi). * For instance, suppose that the bar of Fig. 1-2 has a diameter d of 2.0 inches and the load P has a magnitude of 6 kips. In this example the stress is tensile, or positive. When SI units are used, force is expressed in newtons (N) and area in square meters (m2). Consequently, stress has units of newtons per square meter (N/m2), that is, pascals (Pa). However, the pascal is such a small unit of stress that it is necessary to work with large multiples, usually the megapascal (MPa). To demonstrate that a pascal is indeed small, we have only to note that it takes almost 7000 pascals to make 1 psi. ** As an illustration, the stress in the bar described in the preceding example (1.91 ksi) converts to 13.2 MPa, which is 13.2 106 pascals. Although it is not recommended in SI, you will sometimes find stress given in newtons per square millimeter (N/mm2), which is a unit equal to the megapascal (MPa). Limitations : The equation s P/A is valid only if the stress is uniformly distributed over the cross section of the bar. This condition is realized if the axial force P acts through the centroid of the cross-sectional area, as demonstrated later in this section. 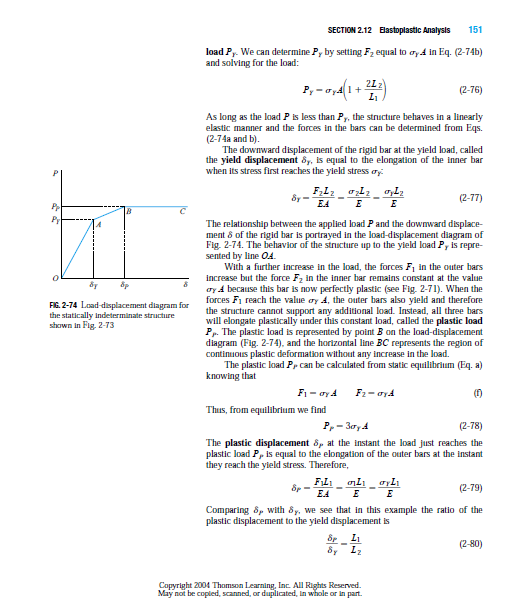 When the load P does not act at the centroid, bending of the bar will result, and a more complicated analysis is necessary (see Sections 5.12 and 11.5). 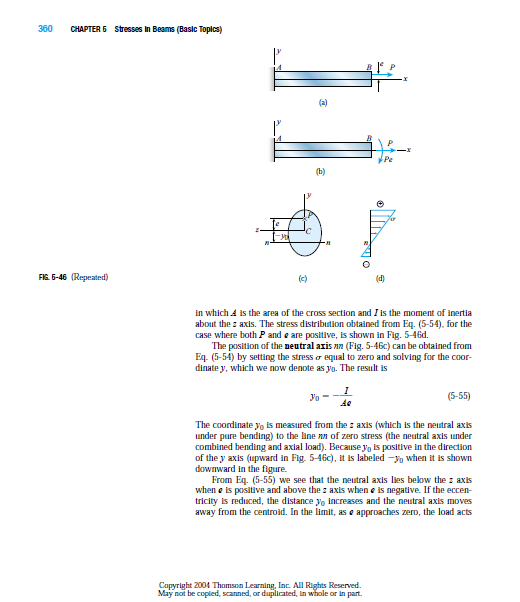 However, in this book (as in common practice) it is understood that axial forces are applied at the centroids of the cross sections unless specifically stated otherwise. The uniform stress condition pictured in Fig. 1-2d exists throughout the length of the bar except near the ends. The stress distribution at the end of a bar depends upon how the load P is transmitted to the bar. If the load happens to be distributed uniformly over the end, then the stress pattern at the end will be the same as everywhere else. However, it is more likely that the load is transmitted through a pin or a bolt, producing high localized stresses called stress concentrations. One possibility is illustrated by the eyebar shown in Fig. 1-3. In this instance the loads P are transmitted to the bar by pins that pass through the holes (or eyes) at the ends of the bar. Thus, the forces shown in the figure are actually the resultants of bearing pressures between the pins and the eyebar, and the stress distribution around the holes is quite complex. However, as we move away from the ends and toward the middle of the bar, the stress distribution gradually approaches the uniform distribution pictured in Fig. 1-2d. As a practical rule, the formula s 5 P/A may be used with good accuracy at any point within a prismatic bar that is at least as far away from the stress concentration as the largest lateral dimension of the bar. In other words, the stress distribution in the steel eyebar of Fig. 1-3 is uniform at distances b or greater from the enlarged ends, where b is the width of the bar, and the stress distribution in the prismatic bar of Fig. 1-2 is uniform at distances d or greater from the ends, where d is the diameter of the bar (Fig. 1-2d). More detailed discussions of stress concentrations produced by axial loads are given in Section 2.10. f course, even when the stress is not uniformly distributed, the equations P/A may still be useful because it gives the average normal stress on the cross section.